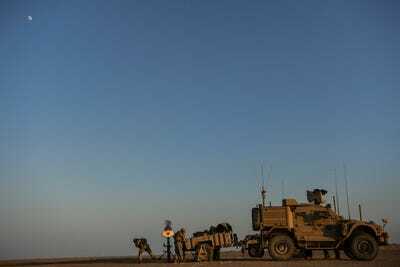 US Air ForceUS Marines fire a mortar during training in support of Operation Inherent Resolve in Syria, July 23, 2018. Despite Trump’s triumphant statement, ISIS still has as many as 30,000 fighters in Iraq and Syria, according to the Pentagon. 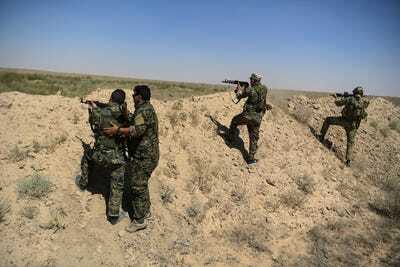 As such, US Marines are still in Syria advising and providing fire support to SDF fighters, and sometimes reportedly at times even getting into direct fire fights (they’re also in country to deter Russian and Iranian influence, which the US largely denies or neglects to mention). The US Air Force released some pretty incredible photos last month of US Marines training for those missions. 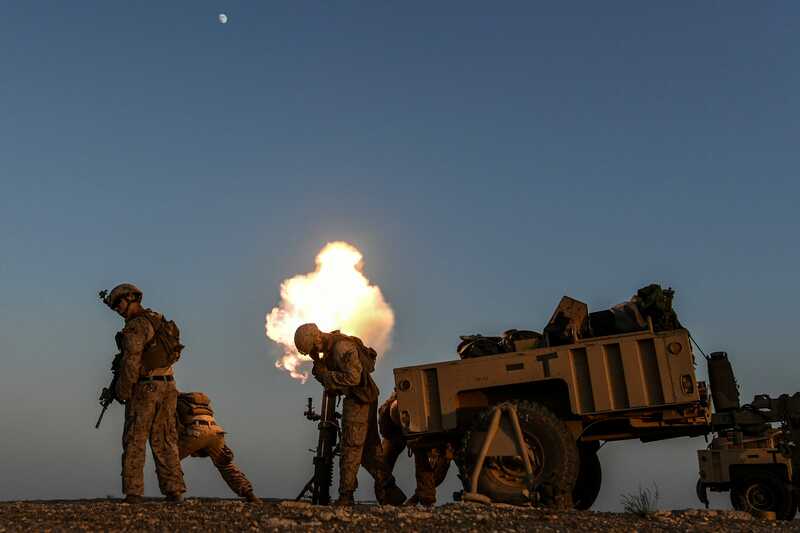 “We can confirm this picture is of U.S. Marines conducting training on a 120mm mortar system in Syria on or about July 23, 2018,” Operation Inherent Resolve told Business Insider in an email. 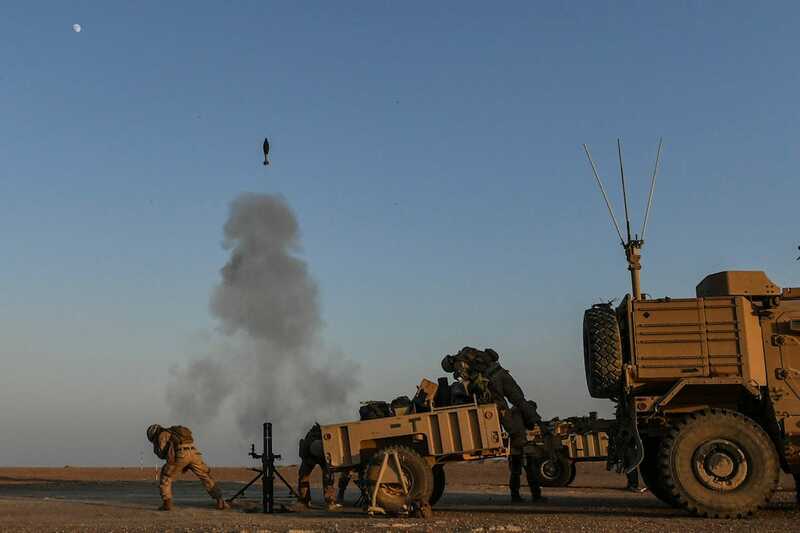 The 120mm mortar has a range of up to five miles and a blast radius of 250 feet when it lands on a target. The Marines are using these indirect fire weapons to strike at ISIS positions and vehicles. 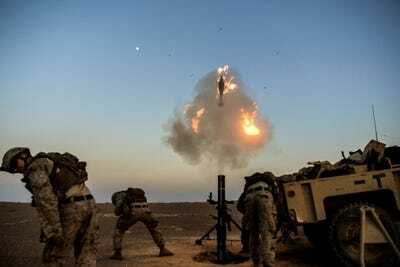 “We do not discuss operational details such as locations or mission specifics, but we can emphasise that building and maintaining combat skills has been an important part of our success against ISIS,” OIR said. Although OIR wouldn’t reveal where these pictures of US Marine mortarmen were taken, this picture was also taken by the same Air Force photog a few days earlier near Dawr az Zawr. Dawr az Zawr is in eastern Syria, east of the Euphrates River, which has largely been a deconfliction line between US and Russian troops, and where US forces also killed about 200 Russian mercenaries in February that encroached into their area attempting to seize an oil field. “The U.S. Marines own and operate many weapons systems, including the M777 howitzer … and the 120mm mortar system pictured,” OIR said. While ISIS still has a presence in Syria, the civil war in Syria appears to be in its last throes, as Syrian President Bashar Assad has retaken much ground and even recently began issuing death certificates for missing political prisoners taken before and during the civil war.